A hugely amusing team game where quite frankly footballing talent is irrelevant! The game is played 5-a-side within the inflatable walled pitch with the players bouncing around on adult sized Space Hoppers trying to outscore the opposing team. This sounds easy but have you ever tried to kick a football while bouncing on a Space Hopper? 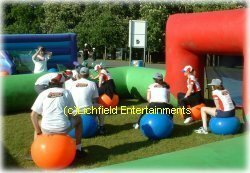 Great for team building events and family fun days, etc. Why not also add a Penalty Shootout game, Human Table Football game or kids Football themed Bouncy Castle?